Not one of us is good. Nope. Not one. At least not on our own. We can not choose good apart from Him. 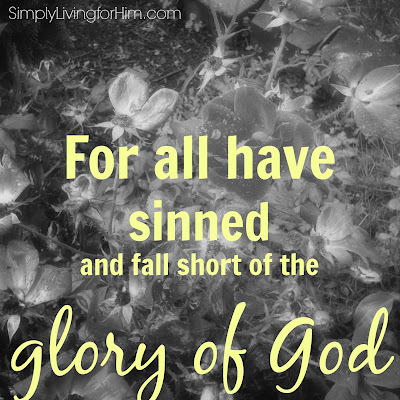 As a sinful man born into this fallen world, none of us have the ability to be “good” alone. Sure we can make good choices, and try real hard, but in the end we will fail at some point. We will mess up. We will falter. My daughter was recently struggling with being “good.” She tries so hard to be “good” but then is disappointed in herself when she messes up. Oh, honey… that is the beauty of the Gospel. We all fall short. We will always disappoint ourselves. Thats’ why we need a Savior. We can’t do it alone. I spent too many years trying to get my children to obey. Yet, there is so much more to obedience than an action. Obedience comes from admitting that you can not do it on your own, and you need a Savior to take over and let His Spirit live in you. When you seek Him first above all, then your actions follow. Then you make the right choices, your behavior is in line with His standards, and you can give Him the glory for what He does. Being “good” is an act of works. But seeking God and behaving well is an outflow or a response to His love for us. That is when behavior truly changes. Our actions flow from our heart! And HE does the work, not us. He changes our hearts and we obey. As parents it is too easy to get caught up in obedience, that we aren’t teaching them to seek God first. Living for Him is something that needs to be taught early on…if we learn to follow Him, then our actions will naturally follow, making it that much easier to choose the “good” path.